Joint Entrance Examination (Main) 2018- With Rank (Paper I and Paper II )JEE Main Result 2018 JEE(Main) Paper-1 (B.E./B.Tech. )or JEE(Main)Paper-2 (B.Arch./B. 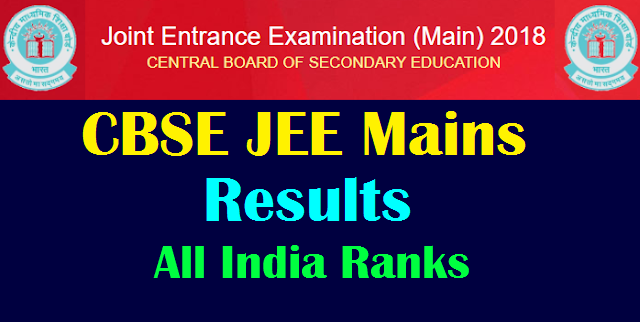 Planning) : CBSE JEE Main 2018 Results, AIR Results by 6 pm Today on cbseresults.nic.in : The Central Board of Secondary Education or CBSE will announce the JEE Main 2018 results of Paper I and AIR All India Ranks Joint Entrance Examination JEE Mains result 2018 on its official website jeemain.nic.in. The Central Board of Secondary Education or CBSE will announce the scores for JEE Main 2018 results of Paper I and JEE Main 2018 Results of Paper II separately. The Central Board of Secondary Education or CBSE will announce the scores for JEE Main 2018 results of Paper I and JEE Main 2018 Results of Paper II separately. The Central Board of Secondary Education or CBSE will announce the scores for JEE Main 2018 results for JEE Main 2018 Exam Paper II on May 31. 4. The Joint Entrance Examination JEE Main results 2018 or JEE Main 2018 Paper I & paper-II results will be displayed on the screen. Candidates are advised to download the JEE Main 2018 Scorecards. This year, 2,24,000 candidates will qualify to take the JEE Advanced 2018 which will be held on Sunday, May 20. 1. Marks obtained in Mathematics in JEE (Main). Aspirant obtaining higher marks will be given better rank. 2. Marks obtained in Physics in the JEE (Main). Aspirant obtaining higher marks will be given better rank. 3. Ratio of positive marks and negative marks. Aspirant with higher absolute value of the ratio will be given better rank. 4. Despite the above three steps, a resolution is not possible, then candidates will be given the same rank. For the academic year 2018-19, as many as 2,24,000 top candidates of JEE Main 2018 will be qualified for appearing in JEE Advanced 2018. Examination Date May 20, 2018. The entire JEE (Advanced) 2018 Examination will be conducted in fully computer based test mode.